Traditional pastel painting has never had the benefit of a wide assortment of specialized tools for applying color. This collection provides a selection of tools for blending, cleaning, overglazing, and removal of unwanted color. Create your own ensemble. Designed specifically for the pastel artist, these brushes make it easy to blend, cut, soften, and dust. 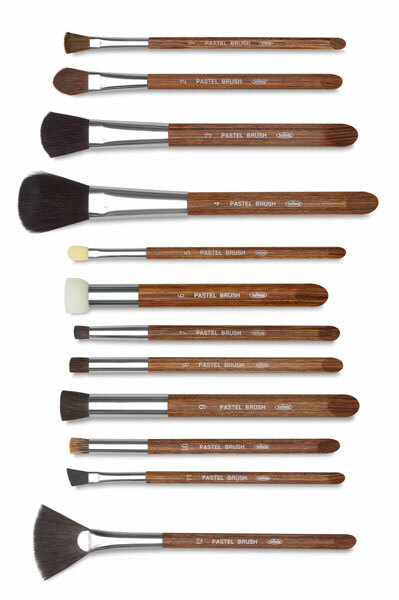 Each brush is mounted on an elegant short hardwood handle, with an angled back edge for scraping or scratching into surfaces. Round Blender, Badger — Badger is the finest natural hair for blending. Round Blender, Horse — Flatheaded round brushes are normally used vertically. The sturdy head strength permits both blending and cleansing operations. Horse Hair. Oval Blender — Improve blending technique with these soft, natural fiber brushes. Choose between goat hair and horse hair. Oval with rounded tip. Angular Fitch — Provided for upright vertical use in the removal of unwanted color. The synthetic bristle fiber resembles black sable. Sponge Brushes — Use a sponge brush to clean small and large drawing areas. Designed to avoid traces of brush strokes. Fan Brush — Used for light overglazing of color and removal of unwanted surface powder. Synthetic bristle fiber.